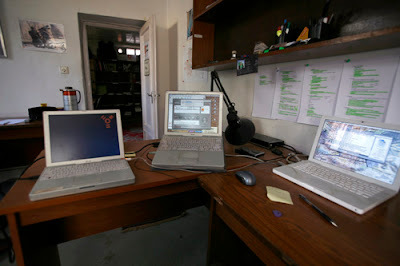 There are only so many Macs in Kabul, and this week I fixed two of them. Not a huge feat, but worth a mention is a country where the locals think a Mac is some kind of teleporter from the Enterprise spaceship. So I now ask my network and the extended galaxy beyond my network: If anyone has the email address of Steve Jobs (Mac Daddy), Can you please pass this blog post onto him. "Steve! If your out there and listening..... We need a Mac store and service centre in Kabul! Its only a matter of time before the Afghans catch onto the craze and are demanding Mac Book Pros and iPods. Well actually they can already get iPods from Bagram Military black market. (See the potential is already here!) So Steve lets open a Mac shop together. You've got one in Tehran, Islamabad and New Delhi. I guarantee that Kabul is the next Mac-Explosion!" I'm Travis From Planet Earth. I live in Kabul, Afghanistan and work in the Central Asian region. Ok I was wrong. Here is the real news. What they dont tell you. Make way for the Kabul Nomads! © 2006 Kabul Korrespondence |Design by Nasim Fekrat.